The Call of Nature: President Warren G. Harding (Edward Sarafian), Henry Ford (Michael Santo) and Thomas Edison (George Ward) get back to nature in Mark St. Germain's historical fantasy. PLAYWRIGHT Mark St. Germain calls his script for Camping With Henry and Tom "fiction suggested by facts," but the play could do with more of the former and less of the latter. The basic premise is rather intriguing: In the summer of 1921, Henry Ford, Thomas Edison and then-President Warren G. Harding actually did take a camping trip together, and St. Germain has imagined what the conversation among these historical figures might have been like if they had been able to sneak off into the woods together. The problem is that the conversation soon turns predictable, since much of the dialogue was culled from the well-documented statements and well-known personal histories of the three men. The characters react to each other much as the men they're based on probably would have. Although their thoughts are clever, they're not too interesting. TheatreWorks' production gets by on the strength of its cast, as well as on the parallels it draws between today's political climate and that of 76 years ago. Harding (Edward Sarafian) was a womanizer whose presidency was rocked by the Teapot Dome scandal, in which his associates secretly leased naval oil reserves to private companies. Edward Sarafian plays Harding as the ultimate waffler, a nonleader who does whatever anyone with a stronger personality tells him he should do. Harding's incurable affability makes him seem like a pushover to Ford (Michael Santo), the man who would be president. Ford has had his "sociologists" dig up the dirt on Harding, but his attempts to blackmail the president backfire in amusing ways. And there's more topical humor in the scenes in which Ford insists that government should be run like a business. George Ward's Edison provides intentional comic relief, refusing to enter into the machinations of his fellow campers and instead tossing out barbs like "Just think of me as Switzerland: cold and neutral." 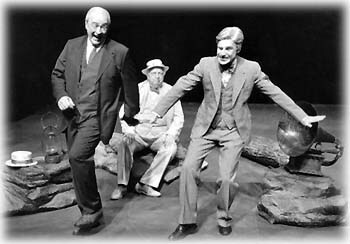 It's not until the play's final scenes that Edison takes sides, and it's not so much for one man as against the other. This backroom/backwoods politicking loses its dramatic impact long before the final curtain. Luckily, there's enough visual stimulation to keep the audience's attention. Set designer Bruce McLeod has created a beautiful slice of Maryland woods on stage, and the shiny Model T in which the three men make their arrival remains on view as a portent of how Ford's invention would encroach upon America's wilderness. Ultimately, this play is more intriguing as an overview of each individual man than it is as a view of the possible sum of their parts. It's too bad St. Germain didn't approach his work with the same kind of energy and imagination that the subjects he's depicting put into theirs.